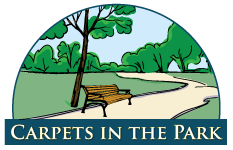 Carpets in the Park collects information from users of its web site, potential clients, prospective employees, and alliance relationships to name a few, including the information you provide to us by submitting information to us through use of the site. Carpets in the Park may keep track of this information and the information that you provide to us when you visit the site for our internal review, business development, research, marketing and promotional purposes, press inquiries or aggregate statistical analysis and site customization. We store this information in our database and do not plan to share it with third parties. If we ever need to share this information with other third parties, we will notify you. At any time you can remove your name and related information from our database, and we will provide you a choice to opt-out if you don’t want your information used for any purpose. You can review and update your information by contacting us at info@carpetsinthepark.com. Carpets in the Park may collect other types of anonymous data from web site users through the use of “cookies,” which are text files that a web site places on the hard drive of your computer indicating what pages you visited. When you return to the web site, your browser sends that information back to the site. Carpets in the Park may use the information provided by cookies to analyze trends, administer the site, or for research and marketing purposes. Carpets in the Park protects your personal information with several security measures. In addition to normal precautions such as physical security and firewalls, we have strict internal security policies.